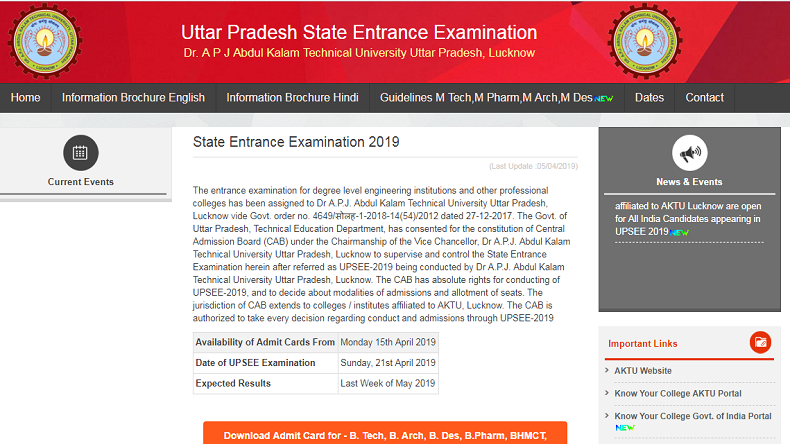 UPSEE Admit Card 2019: The Dr. A P J Abdul Kalam Technical University Uttar Pradesh, Lucknow has released the admit card for Uttar Pradesh State Entrance Examination (UPSEE) 2019 to be held on Sunday, April 21, 2019. Steps to download the Hall Tickets from the official website upsee.nic.in for B. Tech, B. Arch, B. Des, B.Pharm, BHMCT, BFAD, BFA, B. Voc, MBA Integrated, etc exams are given below. UPSEE Admit Card 2019: The Admit Cards of Uttar Pradesh State Entrance Examination (UPSEE) 2019 has been released by the examination conducting authority Dr. A P J Abdul Kalam Technical University Uttar Pradesh, Lucknow on its official website – upsee.nic.in. All the candidates who are going to appear in the upcoming UPSEE 2019 Exam and were eagerly waiting for their UPSEE Admit Cards may now download the same by visiting the official website mentioned above. According to the official website, the Admit Cards are available for B. Tech, B. Arch, B. Des, B.Pharm, BHMCT, BFAD, BFA, B. Voc, MBA Integrated, MCA Integrated, M Tech Dual Degree, and Post Graduate (PG Courses) such as MCA, MBA, MCA Lateral Entry and M Tech, M Des, M Pharma, M.Arch have been published by the authority.